1 Million was inspired by Rabannes metallic fashions and in particular a 1967 dress worn by singer Francoise Hardy. The fragrance was developed by perfumers Christophe Raynaud, Olivier Pescheux and Michel Girard and features notes of fragrance include grapefruit, mint, blood orange, rose, cinnamon, spice notes, blond leather, white woods, amber and patchouli. The bottle is modelled after a gold in got Notes Blood Orange, Grapefruit, Mint, Cinnamon, Rose, Patchouli, Amber, Leather, Woodsy Notes. 1 Million is the expresion of every mans fantasies. A taste for money, sparkling cars, games and pretty girls. It embodies the return of flamboyant masculinity. The 1 Million man is a seducer. He is flamboyant, self confident, daring and irresistable. 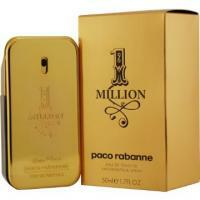 A fresh, spicy leather fragrance, Paco Rabanne 1 Million is the expression of every mans fantasies. It embodies the return of flamboyant masculinity. Paco Rabanne 1 Million fragrance provides a striking contrast, combining refined sensuality and asserted virility. The fragrance opens with sparkling fresh fruits, including notes of frosted grapefruit, blood mandarin and peppermint. The heart is spicy and masculine with rose absolute, musk and cinnamon bark. In the base, sensual leather notes of blond leather, tonka bean and amber ketal round out the fragrance. Ingredients: Alcohol Denat., Fragrance (Parfum), Water (Aqua), Butylphenyl, Methylpropional, Coumarin, Limonene, Hydroxycitronellal, Alpha-Isomethyl Ionone, Linalool, Benzyl Alcohol, Cinnamal, Eugenol, Citral, Isoeugenol, Citronellol.